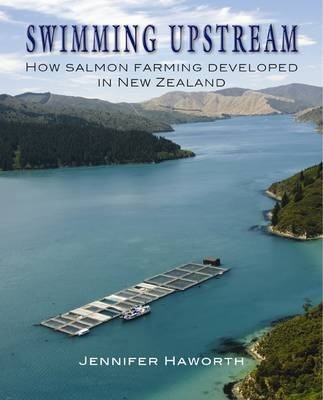 How salmon farming developed in New Zealand. Nowadays New Zealand’s King Salmon is common place; it is found on every supermarket shelf and is an alternative on most restaurant menus. This fish is now a major export earner whose trade is worth in excess of $70 million a year and it provides jobs for hundreds of New Zealanders. It is, however, a relatively new industry based on a premium species of salmon – Chinook. These salmon are not indigenous but were brought here from the McCloud River in northern California at the beginning of the 20th century. Just a few importations of ova were sufficient to establish ‘home runs’ in many South Island rivers. The government believed these fish would form the basis of a canning industry, but the numbers were never sufficient. Instead salmon became a game fish for South Island anglers. In the 1970s there were attempts to introduce legislation to allow trout and salmon farming. Trout farming created a political furore and was dropped but salmon farming was supported by the acclimatisation societies, who could see the value of enhanced river runs developed by private hatcheries. To establish a successful industry experimentation was needed. New Zealanders knew very little about the biology of salmon and even less about salmon farming. But through experimentation and innovative science, salmon hatcheries were able to restock rivers. Ocean ranching was tried. This followed the salmon’s natural pattern and used the sea to rear the fish. When this failed to produce the necessary returns it was abandoned. Sea cage farming became the preferred method but there had to be considerable development and modification for New Zealand conditions. Salmon is now a popular fish in many parts of the world. The discovery that salmon is rich in omega-3 means that it has become not just a luxury but a necessary part of our diet. Swimming Upstream shows how innovative many early salmon farmers were; it covers their trials and problems which nearly cost them their industry and shows how they, as men and women with a passion, won through in the end.